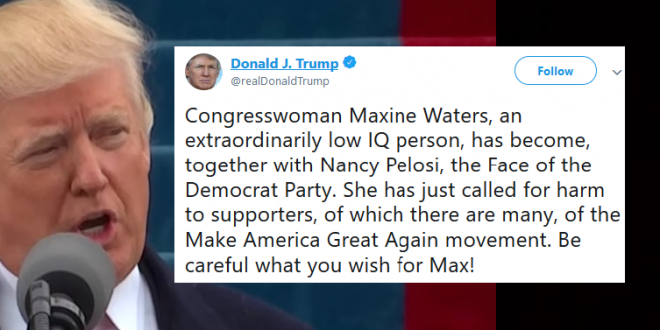 Trump Threatens "Low IQ" Rep. Maxine Waters - Joe.My.God. Glorious Leader just effectively invited his cultists to physically attack a member of Congress. President Trump on Monday responded to Rep. Maxine Waters’ (D-Calif.) call for supporters to confront administration officials in public, saying the congresswoman should be careful what she wishes for. Waters on Saturday called on supporters to confront Trump Cabinet officials in public spaces like restaurants and department stores to protest the administration’s policies. “I have no sympathy for these people that are in this administration who know it is wrong what they’re doing on so many fronts but they tend to not want to confront this president,” she said at a rally in Los Angeles. Trump- LOCK UP HILLARY WITHOUT BEING CHARGED! Trump- KICK KAEPERNICK OUT OF THE US FOR KNEELING! Trump- CHARGE PEOPLE WITHOUT DUE PROCESS! Maxine Waters- Don’t let the Trump admin bully us!